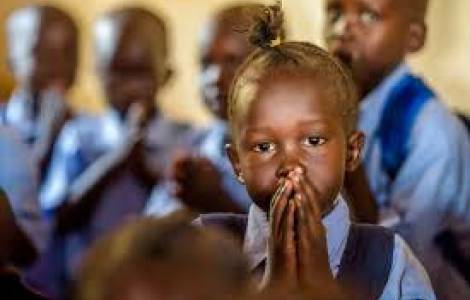 Kara (Agenzia Fides) - The "Day of Fasting and Prayer for Peace in the Congo and South Sudan and in the world", announced by Pope Francis (see Fides 19/2/2018) was welcomed with gratitude by the Christians of South Sudan. "This shows us that we are not alone and that the faithful all over the world are with us on the path towards peace and reconciliation", says James Oyet Latansio, general secretary of the Council of Churches of South Sudan. "The chaos in which the populations of the Congo and South Sudan find themselves, and many African peoples in general, suggests the urgency of a common ideal. This common ideal is nothing but peace and reconciliation", says Father Donald Zagore, theologian of the Society of African Missions (SMA), in view of the Day. "Peace and reconciliation will be an effective reality in Africa only when the Kingdom of God will truly penetrate the depths of the heart of African man. There is a truth of faith that must never be forgotten by our minds: the peace of Jesus is a peace that the world can never give", he continues. Fr. Zagore explains: "Many situations have led and continue to lead to the creation of barriers among African peoples on the African continent. Today we must stand up courageously and prophetically against all these obstacles and barriers to wipe them away and free the hearts and congested spaces. For this reason, humanity in Africa has a decisive role to play. By relying on God, the African peoples are called to work actively to ensure true liberation to the continent. The little every African can do is already a lot in the measure in which he manages to free a being from his suffering, from his pain or from his fear". "The African man - says the theologian - must realize that any act of liberation accomplished in justice and in truth is an act of salvation. We need to discover in depth this soteriological vocation to which Christ invites us and to live it fully in our daily life. In the name of our faith we remain convinced that death will not have the last word". Among the many international churches and religious organizations that have joined Pope Francis’ appeal is that of the Ecumenical Council of Churches (CEC) which, in a letter from the Secretary General, Pastor Olav Fykse Tveit, invites "to join in prayer and fasting, as a global ecumenical community, in the light of political and social tensions, violence and suffering suffered by the citizens of the Congo and South Sudan".